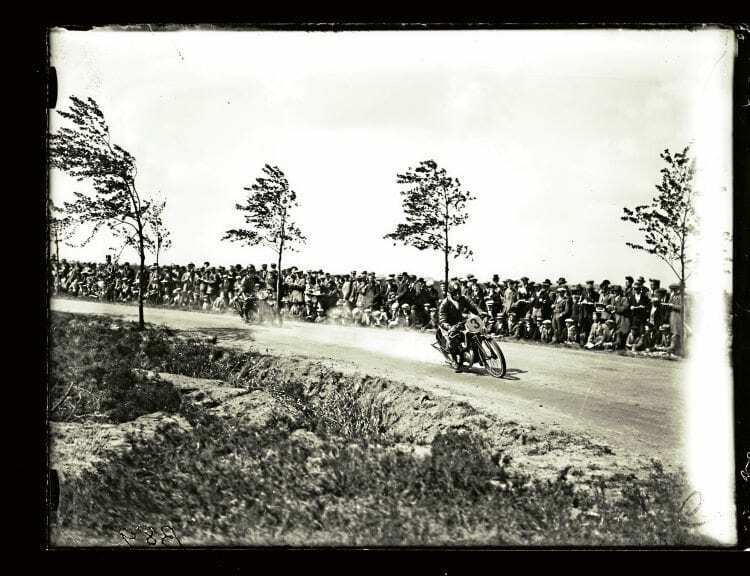 There were four classes in the 1928 Dutch Tourist Trophy – 175cc, 250cc, 350cc and 500cc. In each class there was a British winner. Held on June 23, 1928, a Saturday – the Dutch TT/GP always did and still does take place on a Saturday – there were wins for Graham Walker (500cc Rudge), Stanley Woods (350cc Norton), and the Excelsior-riding Crabtree brother, Syd and Les, who won the 250cc and 175cc races. Magnus (DKW) in the 175cc race, leading Les Crabtree (Excelsior) through Laaghalerveen. Run over the Drenthe circuit, on military land near Assen, the circuit was 17.3km (10.7miles) long, dead flat and possessed of only six corners, joined up by flat-out, dead straight sections. But this was precisely what make the circuit hazardous – after a long spell at 90mph, it proved difficult to judge just how fast (or slow) to take the corners. Hours before the allotted start time – at 10am the three smaller classes were set off together, then the 500cc class in a massed start too – crowds flocked to the sun-drenched circuit, thousands of them on pedal cycles, lots on British motorcycles and plenty in American cars – the Press noted that British cars were a novelty in Holland, Americans the norm. The blue riband Senior event provided a win for Walker, though Tommy Spann on his pushrod AJS was the early leader. Wilmot Evans pushed his Triumph to the front next (as Spann and Walker pitted) but at the end of the 16 laps the winner was Walker, at 75.96mph, with Spann second, just 1.4 secs behind. Third went to Tom, on the Belgian Sarolea.